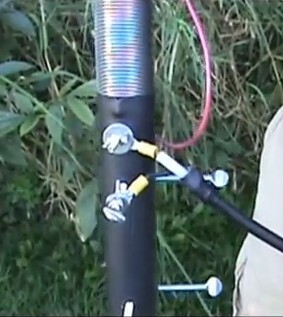 The Silver Bullet Portable Vertical Base antenna uses the same design as our proven line of Silver Bullet coils. This design allows for easy tuning, easy band change, low SWR and perfect match for your radio at the antenna. The antenna is also design for portability with the performance of a base vertical antenna. It may be used at power levels up to 200 Watts SSB, 100 Watts CW and 25 Watts with digital modes. The antenna can be assembled and mounted without tools. The vertical elements are swaged to nest one tube inside the other element. Simply align the mounting holes, depress the locking button and the elements are locked together. The antenna core is made of strong schedule 40 PVC pipe reinforced for added strength. Like our other Silver Bullet coils, the core is grooved for proper separation and spacing of the coil wire. A tuner coupler slides up and down the coil for changing frequency and tuning. All the coil parts are made of corrosive resistant stainless steel. The only parts not made of stainless steel are the copper pig tail wire, the terminal connectors and the thumb screw mounting hardware. These are made of zinc coated steel. The vertical antenna element is made of strong aluminum tubing and built to withstand years of operation. 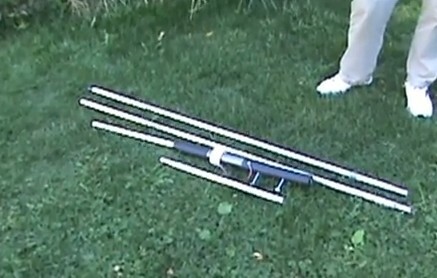 Disassembled, the antenna is no more than 60 inches long for easy transportation. When using all 3 vertical elements the overall height of the antenna is 14 feet 8 inches. The quick connect snap buttons and swag design tubing makes removing the antenna simple and fast allowing the antenna to be taken anywhere you need a base vertical antenna. It's the perfect antenna for field day, emergency communication, vacation homes, QSO parties or if you want a second all-band antenna for your station. Mounting the antenna is quick and easy. The core design is made to allow mounting the antenna by slipping the core over a mounting pipe or ground rod up to 1 inch in diameter. Simply tighten the supplied thumb screws to secure your antenna base. This mounting option provides antenna ground eliminating the need for radials. You can also mount the base using TV mounting type 1 1/2 inch U-bolts (not supplied) available at your local hardware or home improvement store. 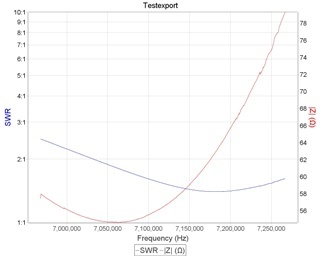 As with any vertical, adding radials will improve your vertical antenna's performance. To connect the feed line to your antenna simply connect the center conductor to the top #10 wing nut and attach the braided ground of your coax to one of the bottom thumb screws used to mount the base to your mounting tubing. Use this same, lower thumb screw to mount any radials you may wish to add. For our club Field Day I was tasked to do an HF setup in the local park. Most of the local club are 2M operators so that's why I was given this task. I took out the Wolf River Portable Vertical and had it set up in about 15 minutes. 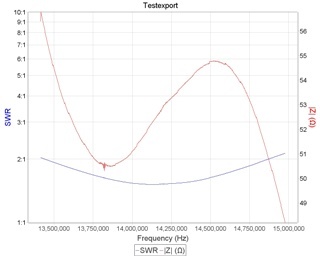 Usually I can have it set up quicker than that but the SWR for 20M was being a bit flaky. In other locations I have used it I have had no problems at all. I blame the soil. Very dry and rocky for a park. I do use 3 radials with mine all the time. Once I got it resonant it worked great. 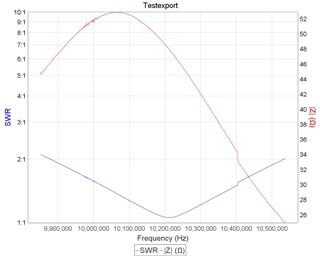 The coil design allows simple tuning for the lowest SWR and broad-banded performance. The antenna will handle up to 300 watts on a dead key. 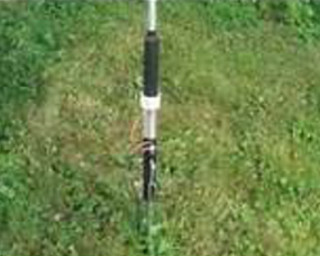 Due to shipping cost, we sell the Silver Bullet Portable Vertical Base Antenna to US hams only. 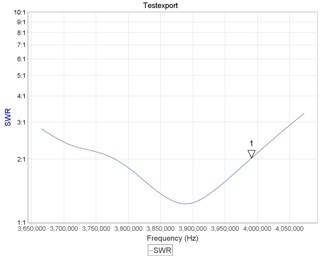 These SWR plots were created with a Mini-VNA Pro. 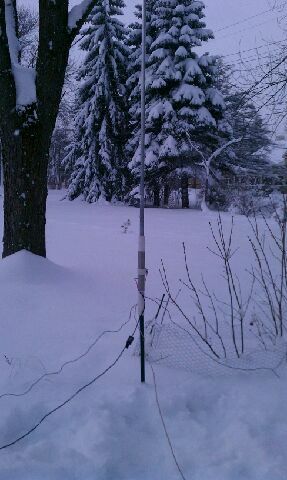 The antenna was ground rod mounted. No ground radials were used when measurements were taken.